Today’s post was written by Bill Baer, senior technical product manager for the SharePoint team. In April, we broadly announced our vision, strategy, timeline and investment in three major areas: familiar and intuitive user experiences, cloud-inspired infrastructure with hybrid at the core and robust security and compliance for SharePoint Server 2016. Today we’re excited to announce availability of both SharePoint Server 2016 IT Preview and the new cloud hybrid search preview for SharePoint Server 2013 and 2016. As we continue to develop SharePoint Server 2016, we’re paying close attention to trends in content management, team collaboration, user experiences across devices, and how the cloud can be blended into existing on-premises scenarios in new and compelling ways. We’ve been working hard to get this out to you, and we know you’ve been waiting patiently since we announced that it was coming. This is a long post, but there is a lot of important information, so if you want to jump in and install the preview, I really encourage you to read it completely. SharePoint Server 2016 IT Preview provides a first look at a select set of new infrastructure investments that will help define the scope, scale and reliability of SharePoint Server 2016. Since we’re building SharePoint Server 2016 on the same core platform for SharePoint Online, you won’t be surprised to see similarities between the two. 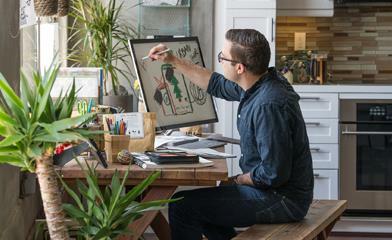 SharePoint Server 2016 unlocks new user experiences that are intuitive, yet familiar. For IT professionals, it delivers improved performance and scale with simplified management. And for developers, it offers an opportunity to build for cloud or on-premises. As we move forward with future preview releases, we’ll continue to add new capabilities that represent our investments in audience and workload capabilities. What we’re sharing today is just a fraction of what will be in SharePoint 2016! One of the more difficult challenges, beyond deploying software, is managing the IT infrastructure to support it. In many cases, IT investments directly impact the bottom line. SharePoint Server 2016 has been designed to reduce the emphasis on IT and streamline administrative tasks, so IT professionals can concentrate on core competencies and mitigate costs. Tasks that may have taken hours to complete in the past have become simple and efficient processes that allow IT to focus less on day-to-day management and more on innovation. Improved provisioning capabilities help IT departments and hosting service providers maximize existing infrastructure investments while exploring new services, improved management and higher availability through an improved role-based installation architecture. Making decisions faster and keeping in contact are critical capabilities for increasing effectiveness in any organization. The ability for end users to access information while on the go is now a workplace necessity. In addition to a consistent cross-screen experience, SharePoint Server 2016 provides the latest technologies and standards for mobile push and information synchronization. You need to be sure your software works on the devices your users prefer. With deep investment in HTML5, SharePoint Server 2016 provides IT professionals and designers with capabilities that enable device-specific targeting of content. This helps ensure that users have access to the information they need, regardless of the screen they choose to access it on. SharePoint Server 2016 further empowers your workforce by delivering a consistent experience across screens, whether using a browser on the desktop, a mobile device, tablet or slate. Through this rich experience, users can easily transition from one client to another without having to sacrifice feature fidelity. The App Launcher provides a new navigation experience where all your apps are easily available from the top navigation bar. You can quickly launch your application, browse sites and access your personal files. Based on our investments in SharePoint Online and OneDrive for Business, SharePoint Server 2016 document libraries inherit the new, improved control surface for working with files and content, simplifying the user experience for file creation, sharing and management. SharePoint Server 2016 improves the sharing experience by making it more natural for users to share sites and files. Just click the Share button at the top right corner of every page, enter the names of people you want to share with, and press Enter. That’s it; you’re done! The people you just shared with will get an email invitation with a link to the site. SharePoint still uses powerful concepts like permission levels, groups and inheritance to provide this experience, but you don’t have to understand those concepts anymore to accomplish everyday tasks like sharing a site. Part of sharing is also understanding who can see something. If you want to find out who already has access to a particular site, simply go to the Settings menu in top right corner, click Shared with, and you’ll see the names and pictures of people who have access to the site. The world of collaboration has changed, and text-based files are shifting to modern media, videos, audio and more. SharePoint Server 2016 provides support for uploading files up to 10GB. Preventing data loss is non-negotiable, and overexposure to information can have legal and compliance implications. SharePoint Server 2016 IT Preview provides a broad array of features and capabilities designed to make certain that sensitive information remains that way, and to ensure that the right people have access to the right information at the right time. New In-Place Hold Policy and Document Deletion Centers, which allow you to manage time-based, organization-wide in-place hold policies to preserve items in SharePoint and OneDrive for Business for a fixed period of time, in addition to managing policies that can delete documents after a specified period of time. You can download SharePoint Server 2016 IT Preview today via the Microsoft Download Center and share feedback directly with our engineering teams through the new SharePoint Server 2016 IT Preview forum. We also welcome feature requests and feedback via the SharePoint Server suggestion box on UserVoice, @SharePoint on Twitter, and in the comments below. We’re eager to hear your feedback and use it to make SharePoint Server 2016 the best experience for information workers, IT professionals and developers alike! Today we’re also pleased to announce the availability of the new cloud hybrid search preview, which allows customers using SharePoint Server 2013 and Office 365 to retrieve unified search results through a combined search index in Office 365. This new hybrid search solution is also native to SharePoint Server 2016 IT Preview. With this new hybrid configuration, this same experience will also allow customers to leverage the power of Office Graph to discover relevant information in Delve—regardless of where information is stored. 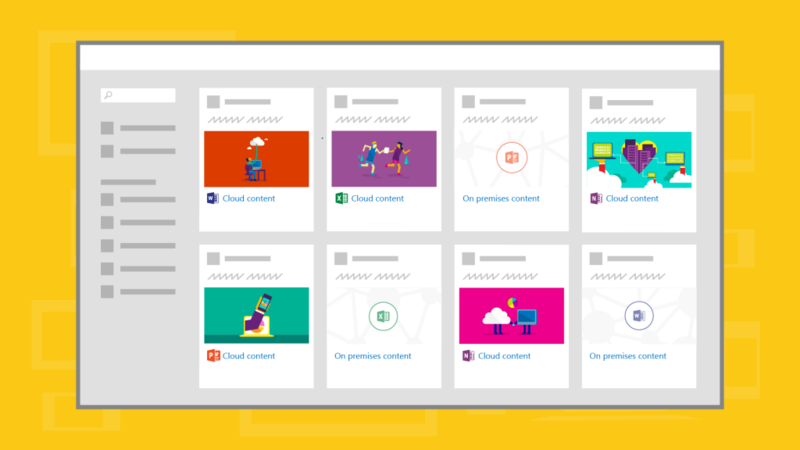 You’ll not only be able to get back to all the content you need via Delve, but also discover new information in the new Delve profile experiences and even have the ability to organize content in Boards for easy sharing and access. On-premises and Office 365 search results in Office Delve. Cloud hybrid search offers users the ability to seamlessly discover relevant information across on-premises and Office 365 content. With the cloud hybrid search solution, you index all your crawled content, including on-premises content, in your search index in Office 365. When users query your search index in Office 365, they get unified search results from both on-premises and Office 365 cloud services with combined search relevancy ranking. The ability to reduce your on-premises search footprint. The option to crawl in-market and legacy versions of SharePoint, such as 2007, 2010 and 2013, without requiring upgrade of those versions. Avoiding the cost of sustaining large indexes, as it’s hosted in Office 365. The new cloud hybrid search solution is the first step in our new hybrid vision that allows customers to take advantage of new innovation in Office 365. You can download cloud hybrid search today via the Microsoft Download Center and share feedback directly with our engineering teams through the new cloud hybrid search forum. To keep up-to-date with all of our hybrid scenarios across Office 365 visit our new hybrid resources center. As Plato said, “The beginning is the most important part of the work,” and we’re excited to start the journey for the next generation of SharePoint with SharePoint Server 2016. Q. 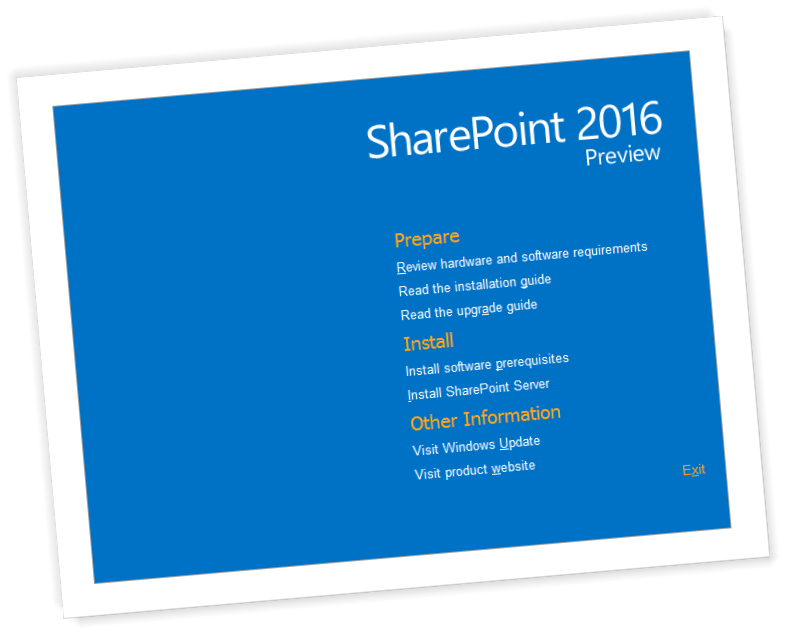 Can I install SharePoint Server 2016 IT Preview or the cloud hybrid search preview in production environments? A. It is not recommended to install SharePoint Server 2016 IT Preview in production environments. Q. Can I upgrade SharePoint Server 2016 IT Preview to RTM when released? A. No, SharePoint Server 2016 IT Preview cannot be upgraded to RTM. Q. When can I start using cloud hybrid search? A. While the cloud hybrid search preview is now available, it will not be available to be configured for use with Office 365 until early September. Q. What will happen to my indexed content in Office 365 when the cloud hybrid search service is released? A. The indexed content will remain in the Office 365 index when the cloud hybrid search service is released. You will not need to re-index any on-premises content. Q. Where can I learn more about cloud hybrid search? A. To learn more about cloud hybrid search see connect.microsoft.com/office/SelfNomination.